This review is so much fun! My favorite item(s) so far!! As part of the The Old Schoolhouse Homeschool Crew, I got the chance to review a selection of products from Virginia Soaps & Scents. The set included 3 bars of soap (and if you go read about it here, you discover this is real soap -- not the detergents referred to as soap that we purchase in stores), a shampoo bar, and a laundry soap kit. 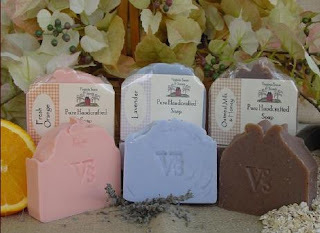 Virginia Soaps & Scents is a homeschooling family owned business, started based on a hands-on history lesson. They take their craft seriously, with wonderful results. I've been wanting to make my own laundry soap for a long time. I even had all the ingredients on hand, but I just couldn't get myself to go ahead and do it. Well, having to do it was a good thing! I found an empty scout popcorn tin (believe me, we have a few of those around! ), and used a canning ring to do basically a double-boiler. Melted the soap in water, added the already measured dry ingredients, stirred, added more water, and let it sit. Easy peasy. It took maybe fifteen minutes. And... it works great! My kids' clothes were actually coming out cleaner with this than they have been. I am almost out (I think we'll finish it tomorrow), and then I will probably make some laundry soap using what I have on hand... but soon, very soon, I absolutely am purchasing the laundry soap bars from VSS. The greatest thing about their laundry soap is that you can choose how much work you want to do. You can purchase it in a kit, where the soap is already shredded, and the Borax and Washing Soda are included and already measured. That is ideal for trying it out without committing to huge boxes of ingredients. Or you can purchase the bars, grate them yourself, and add your own other ingredients. The shampoo bar was Ginger Lime. Okay, never heard of a bar of shampoo. But I loved it. The folks at Virginia Soaps & Scents started making this for some Civil War re-enactors. Anyway, you get your hair wet, rub the bar across your head a few times, then wash as usual. The scent was very, very mild (It was mild enough that my husband didn't complain about it when he tried it.) I did not use conditioner. My hair felt a little weird, and I just let it air dry (I do own a hairdryer. I know I do. I use it every fall to put plastic on the windows.) When I went to brush it, I was pretty surprised at how full it looked. The next day it looked even better. And because it was a pretty sedentary week, I decided to see how long it would look presentable. The fourth day it looked a bit grungy, but still acceptable. And I am thrilled. Colorado is SO DRY, and taking showers daily to keep my hair looking decent means having to slather a ton of lotion onto my skin to keep it from flaking off. With the shampoo bar, I think I have a nice, happy medium. At least until I do something crazy like starting to work out every day again. I have not used conditioner at all since starting the shampoo bar. And my hair has felt "right" since the second time I used the bar. I want to order more! This would also be one way to bring your own shampoo in your carry-on luggage, as it is not liquid. Last was the soap. They sent mini-bars of three different ones... Fresh Orange (smells yummy! ), Oatmeal, Milk and Honey (textured, simply wonderful), and Coconut Lemongrass (the lemongrass scent is fabulous). These made me feel pampered, and every time I have washed my hands I reflect on how lucky I am to be on the Crew! My hands are far softer than when I use the liquid soap pump, and I'm using the soap far more often. Check the website, read their stories, and look at the yummy looking soap. I want to try the Cookies and Cream, and the Badlands ones from their gourmet soaps page. The products all seem to be a good value as well. The soap is quite long-lasting, as long as you store it properly. The regular soaps start at $4.50 for a single 4.5 ounce bar, with discounts for purchasing in larger quantities. The shampoo bars, slightly larger at 5.5 ounces, are $5.50 for a single bar. The laundry soap bar is $3.95, which makes two batches of unscented laundry soap, or the kit is available for $4.95. I wish I had the funds available to give out a few dozen of the soap trios (near the bottom of the page) for Christmas this year. Oh, and the sampler pack at the top? That's the size of soap I received. I love that size, and am tempted to figure out a way to order a sampler set for me. Disclaimer: As part of the TOS Homeschool Review Crew, I did receive these products for free from Virginia Soaps and Scents. The fact that I received a complimentary product does not guarantee a favorable review. It does guarantee a review. A fair review. But I am not going to praise something unless I think it deserves the praise. If I don't like it, you'll hear that. And hopefully with enough detail as to why so you can decide for yourself if what I hate about it makes it perfect for your family. For more about my take on reviews, visit my blog post here.